Living downtown definitely has many advantages . . . the convenience, walk-ability, energy, access to workplaces, nightlife, shopping and dining. One of the challenges of urban living can be creating or preserving privacy. With a little creativity and not much expense, you can add privacy without sacrificing light or space. 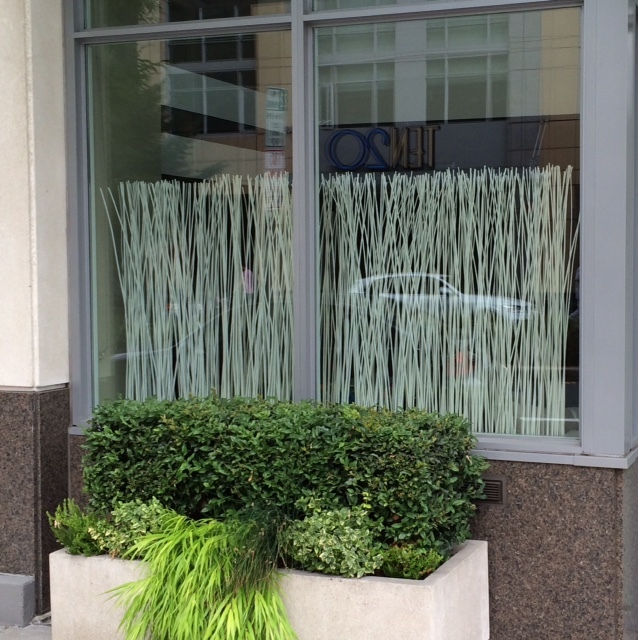 This unique window treatment creates an artsy visual barrier to the sidewalk without blocking natural light. The courtyard of this townhouse faces a busy street but easily becomes a private outdoor retreat with the addition of a silk boxwood hedge supported by several narrow rectangular pots. The result is plenty of sunlight yet complete privacy from anyone passing by. Think outside the box when considering design alternatives for your window, courtyard or terrace. 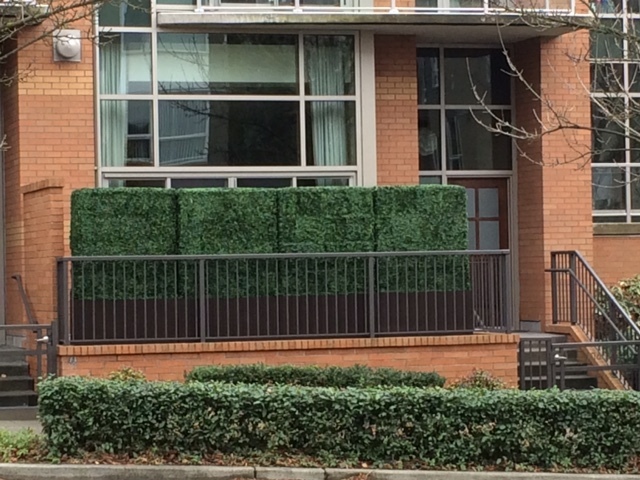 Decor items that aren’t specifically intended for screening can, when grouped together, can create an artful display that functions as a unique privacy screen. If you’ve been thinking about buying a home . 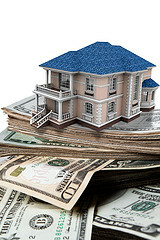 . .
Did you know that over 75% of all home buyers qualify for down payment assistance. Many prospective home buyers (single family or condo) thinking about buying a home have put off pursuing financing options because they’re pessimistic about being able to qualify for a mortgage. There are many down payment programs available and some extend beyond just first time home buyers. Down payment assistance tends to suffer from a lack of awareness, so talk with your lender and take the time to research these programs as part of the loan process. In most cases down payment assistance is offered in the form of a second zero or low interest mortgage. There is no repayment of that mortgage due until the home is sold, refinanced or transferred. With down payment assistance qualified buyers can receive as much as 3% of the mortgage loan amount to be applied toward the down payment and closing costs. For more information about eligibility requirements contact a lender who offers down payment assistance programs. Buyers will need to complete a buyer education class (offered by many lenders) and must plan to use the property as their primary residence. With mortgage interest rates at historic lows and rents continuing to increase, this is an excellent time to buy a home. You know its spring when these annual events are on the calendar. March may have come in like a lamb, but the local spring real estate market definitely came in like a lion. With a healthy job market, historically low interest rates and high buyer demand, there’s a shortage of available condos and houses across the Puget Sound region. The numbers for closed and pending sales were up 20%+ last month resulting in just over a one month supply of available inventory in many markets. Newly listed properties are selling quickly, multiple offers are common, and available inventory is unable to keep up with buyer demand. This is driving prices up and causing frustration for buyers who are facing a lack of homes to choose from. While condo inventory is thin in all major eastside cities, nowhere is it more evident than downtown Bellevue. There are less than 100 condominiums on the market downtown with half of those being new construction units (most priced in the higher, luxury price range). Removing new construction units from the inventory reveals just 40 resale (previously owned) condos representing barely a one month supply of inventory — a 4-5 month supply of inventory is considered a balanced market. With inventory levels this low multiple offers and sales over list price are common. 35% of the condos sold in downtown Bellevue in March sold over list price. Favorable interest rates are expected to continue through early summer, but should rates begin to edge up later this year, we may also see escalating prices ease as well. Any increase in interest rate also impacts a purchaser’s buying power. With low interest rates, low inventory and high demand, its the perfect storm. Now could be a prime time to sell a personal residence or investment property. 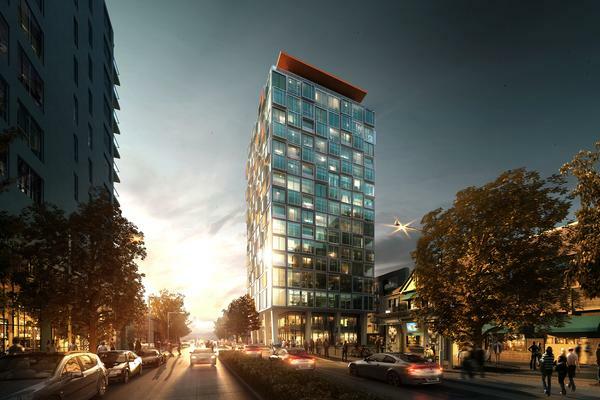 Its been many years since there’s been news of new condominiums in downtown Bellevue. This week the Puget Sound Business Journal reported on the announcement of a new project to be built on NE 10th Street where a Papa John’s Pizza and several other low rise buildings currently stand. Create World America has partnered with GGLO and Lease Crutcher Lewis to design and build a mixed use project consisting of apartments and condos. Construction of the first phase, a six story 162 unit mid-rise apartment structure, is expected to begin the end of this year. Planned for the second phase is a 110 unit high rise condo building. What’s unique about the condo design is that the 3 bedroom floor plans will be specifically designed with multi-generational and extended families in mind. New construction condos have been absent from Bellevue’s skyline for quite some time. The last new condos built downtown were Bellevue Towers and Washington Square which were constructed in 2008/09. Today’s Seattle Times (http://www.seattletimes.com/business/real-estate/home-prices-in-seattle-pop-nearly-19-percent-for-the-year/) reported on increasing property values and declining housing inventory levels in Seattle; the same is true for the Eastside. The number of available single family homes and condominiums for sale in and around Bellevue has been at historic lows for many months. With more buyers than there are available homes demand is high and multiple offers are driving up prices. Shorter market time, multiple offers and sales over the list price are common. In downtown Bellevue there are currently less than 100 condominiums listed for sale. Of those, barely a third are resale units. (The balance of available condos represent the remaining developer owned units at Washington Square built in 2009.) There is currently barely a one month supply of available resale condo inventory – 4 to 5 months is considered a balanced market. Why are active listings so scarce? 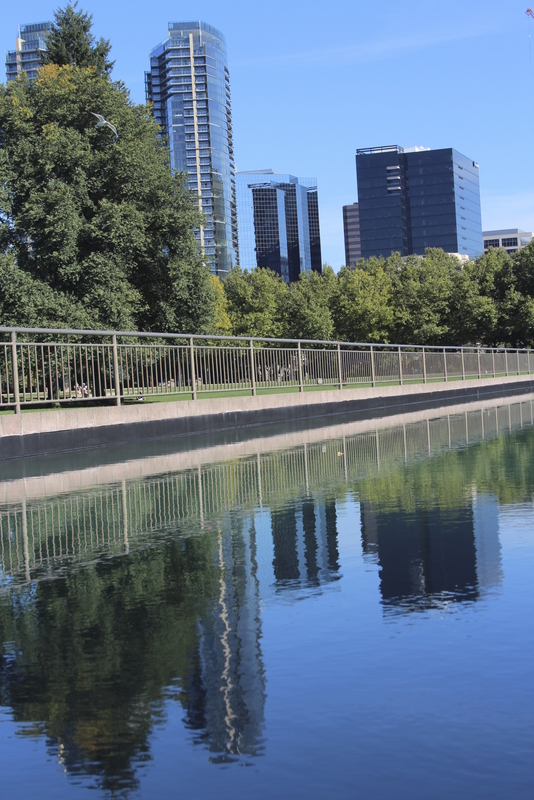 Bellevue is a highly rated, desirable place to live. Award winning schools, a thriving economy, abundant parking, strong job market and a vibrant and safe downtown are driving demand for housing. Its a great place to live, work and raise a family. Existing condominium communities are the only current option for absorbing buyer demand. All the tower cranes downtown are supporting construction of mixed use office projects or rental apartments. No new construction condo communities are scheduled for completion in the central business district for several years. To build anything new downtown an existing structure or community will need to come down before something new can go up. Expedia publicly announced its decision this week to purchase the Amgen campus and relocate its Bellevue headquarters to Seattle in late 2018. This is a good move for Expedia, providing the space the company needs for future growth and the Seattle address it desires for attracting quality tech talent. 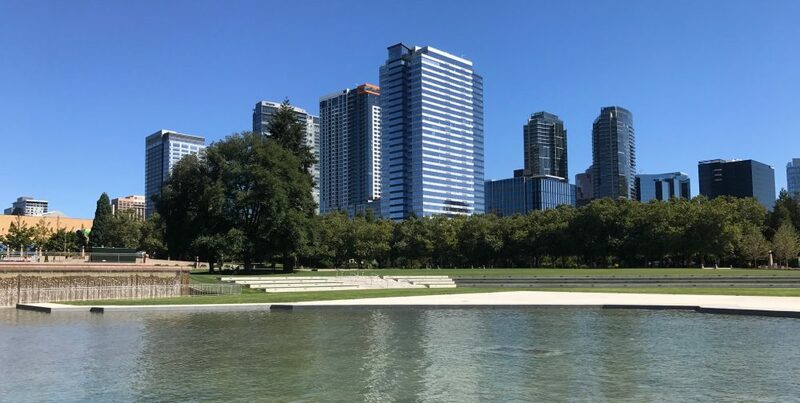 This week’s media has been full of speculation about the impact this major corporate relocation will have on downtown Bellevue. Bellevue probably doesn’t have anything to worry about. Expedia’s departure in late 2018 is still 3 1/2 years away. With the strong economy, shortage of quality office space in downtown Bellevue and high interest in the office towers currently under construction, its likely the Expedia space could be leased before its vacated. The departing 3,000 employees will be quickly replaced by companies who will occupy not only the Expedia Building but also three other office towers under construction by Kemper Development, Schnitzer West and Trammel Crow. Getting back to the significance of a Seattle address for attracting talent . . . a Bellevue address certainly isn’t lacking in appeal. 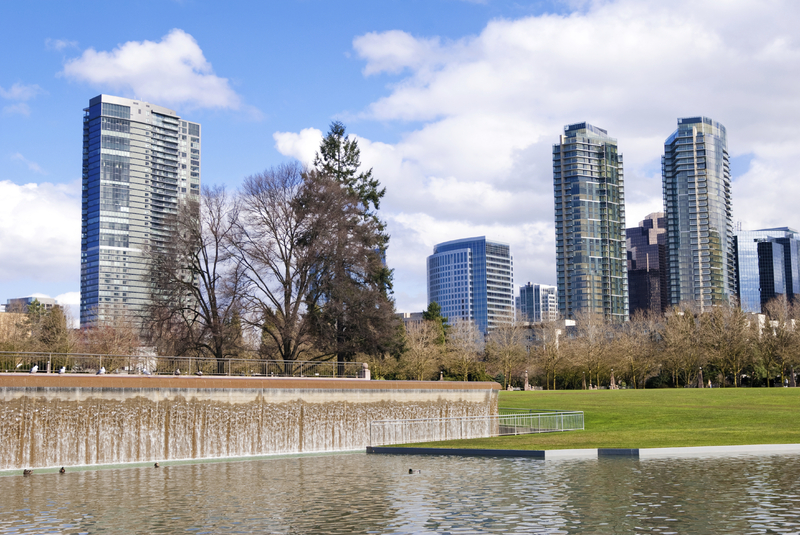 Downtown Bellevue is home to national and international corporations and has a vibrant and growing central business district. No matter where you live on the eastside there’s access to high quality neighborhood public schools, safe communities, thriving local economies, world class health care, some of the finest shopping north of San Francisco, dining, arts and entertainment venues and dozens of urban, lakefront and sports parks. This is a really great place to live and work. 75% of Expedia’s 3,000 employees currently live on the eastside. It will be interesting to see what percentage of those employees make the move to Elliott Bay. And what impact will adding that many commuters have on Seattle traffic. Move over Amazon, Facebook and Alibaba commuters – you’ve got company coming.